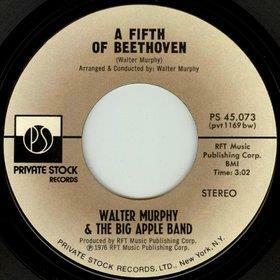 (1975) "A Fifth of Beethoven"
"A Fifth of Beethoven" is a disco instrumental recorded by Walter Murphy and the Big Apple Band. It was adapted by Murphy from the first movement of Beethoven's Fifth Symphony. The record was produced by noted production music and sound effects recording producer Thomas J. Valentino. It was one of the most popular and memorable pieces of music from the disco era. The "Fifth" in the song's title is a pun, referencing a liquid measure approximately equal to one-fifth of a gallon, a popular size for bottles containing hard liquor, as well as Beethoven's Fifth Symphony from which the song was adapted. The song when released entered the Billboard Hot 100 at number 80 on May 29, 1976, and took 19 weeks to reach number 1, where it stayed for one week becoming Murphy's best known work and his only Top 40 hit. Early in 1977, it was licensed to RSO Records for inclusion on the soundtrack to the movie Saturday Night Fever. Even though Murphy played nearly every instrument on the instrumental, his record company cautioned that the record would stand a better chance if credited to a group rather than an individual. To Murphy's annoyance, they came up with the name Walter Murphy and the Big Apple Band, only to discover two days after its release that there was already a Big Apple Band. The name on the label was changed to The Walter Murphy Band and then simply to Walter Murphy. In 1974, Murphy was in the process of writing a disco song for a commercial, when the producer gave him the idea of "updating classical music," which "nobody had done lately." He then mailed a demo tape to various record labels in New York. Although response was unimpressive, a rendition of Beethoven's "Symphony No. 5 in 'C' Minor" generated interest from the owner of Private Stock Records, Larry Uttal. Murphy agreed to produce the song under contract and recorded it in 1976. The song was a smash hit, and reached number 80 on the Hot 100 on May 29, 1976, eventually reaching number 1 within nineteen weeks, where it stayed for one week. An album under the same name was released later during the year; the album notably featured a rendition of Nikolai Rimsky-Korsakov's "Flight of the Bumblebee" entitled "Flight '76", which reached number 44 on the Hot 100. Robin Thicke's 2002 song "When I Get You Alone" is based on "A Fifth of Beethoven", as is "Enjoy Yourself" (1999) by A+. It was also featured in the game LittleBigPlanet 2, mixed with "Welcome to Jamrock" on DJ Hero 2, the movies Mystery Men, Semi-Pro, and The Stepford Wives. The song was featured in a 2006 episode of the animated comedy television series Family Guy; Murphy is one of the composers for the series. A snippet of "A Fifth of Beethoven" can be heard during Chicago Bulls games, whenever the opposing team loses possession of the ball. It is the official song of the Worcester College, Oxford JCR, and was notably played during visits by alumni Emma Watson and Rupert Murdoch during the college's Tercentenary year, and yearly at the end of year bop. ^ Bentkowski, Tom (March 28, 1977). "Ludwig on the Charts". ^ "Thomas J. Valentino Is Dead; Early Sound Effects Producer". ^ Campbell, Mary (October 15, 1976). "Beethoven Arranger Having Ball". ^ a b "Forum – ARIA Charts: Special Occasion Charts – Top 100 End of Year AMR Charts – 1970s". Australian-charts.com. Hung Medien. Retrieved 1 June 2014. ^ "Austriancharts.at – Walter Murphy & The Big Apple Band – A Fifth Of Beethoven" (in German). Ö3 Austria Top 40. Retrieved June 3, 2013. ^ CHART NUMBER 1026 – Wednesday, September 08, 1976 at the Wayback Machine (archived November 7, 2006). CHUM. Retrieved June 13, 2014. ^ "Top RPM Adult Contemporary: Issue 4280." RPM. Library and Archives Canada. Retrieved June 3, 2013. ^ "Top RPM Singles: Issue 4340a." RPM. Library and Archives Canada. Retrieved June 3, 2013. ^ "Officialcharts.de – Walter Murphy & The Big Apple Band – A Fifth Of Beethoven". GfK Entertainment. Retrieved June 3, 2013. ^ "Indice per Interprete: M" (in Italiano). Hit Parade Italia. ^ "Nederlandse Top 40 – Walter Murphy & The Big Apple Band - A Fifth Of Beethoven search results" (in Dutch) Dutch Top 40. Retrieved June 3, 2013. ^ "Dutchcharts.nl – Walter Murphy & The Big Apple Band – A Fifth Of Beethoven" (in Dutch). Single Top 100. Retrieved June 3, 2013. ^ "Charts.org.nz – Walter Murphy & The Big Apple Band – A Fifth Of Beethoven". Top 40 Singles. Retrieved June 3, 2013. ^ "Norwegiancharts.com – Walter Murphy & The Big Apple Band – A Fifth Of Beethoven". VG-lista. Retrieved June 3, 2013. ^ "South African Rock Lists Website SA Charts 1969 – 1989 Acts (M)". Rock.co.za. Retrieved June 3, 2013. ^ "Swedishcharts.com – Walter Murphy & The Big Apple Band – A Fifth Of Beethoven". Singles Top 60. Retrieved June 3, 2013. ^ "Swisscharts.com – Walter Murphy & The Big Apple Band – A Fifth Of Beethoven". Swiss Singles Chart. Retrieved June 3, 2013. ^ "Archive Chart: 1976-08-14" UK Singles Chart. Retrieved June 3, 2013. ^ a b c "A Fifth of Beethoven – Awards". ^ CASH BOX Top 100 Singles – Week ending OCTOBER 9, 1976 at the Wayback Machine (archived September 2, 2012). Cash Box magazine. Retrieved June 13, 2014. ^ RECORD WORLD 1976 at the Wayback Machine (archived May 9, 2006). Record World. Geocities.com. Retrieved June 13, 2014. ^ "Top Singles – Volume 26, No. 14 & 15, January 08 1977". ^ "Top 100 Hits for 1976". The Longbored Surfer. Retrieved June 13, 2014. ^ The CASH BOX Year-End Charts: 1976 at the Wayback Machine (archived August 25, 2012). Cash Box magazine. Retrieved June 13, 2014. ^ "Canadian single certifications – The Walter Murphy Band – A Fifth of Beethoven".